Just when you thought the Redsbaby Bounce pram couldn’t possibly get any better, the Redsbaby team deliver a heap of rather handy new Bounce accessories into the mix – and believe us when we say it will be easy to go crazy with such style at unbelievable prices. Remember the all awesome, super stylish and budget friendly Bounce pram from Redsbaby we featured earlier this year? Well good news folks, now you can turn this stunning ride into the ultimate travel system with the help of their new additions to the Bounce pram accessory range. A whole line up of magnificent accessories really is the icing on the Redsbaby pram cake, letting you put all the final touches on this dreamy pram! We adore a travel system here at Babyology HQ and the Maxi-Cosi Mico Capsule Adapters (priced $29.95) are a real game changer. Designed to fit the Redsbaby Bounce pram, you can take your sleeping baby bundled up in the Maxi-Cosi Mico Capsule car restraint from the car to the pram without having to disturb them. Simply slide the capsule onto the adapters and you’re good to go, there’s no fussing or resettling required since baby can stay blissfully asleep. We still have lots of cool days and nights ahead during the rest of winter and then into spring, and we’d hate to let pesky cold weather keep us indoors. The So Fleecy! Winter Pouch provides the ultimate snug and warm environment for a little one to cocoon in, warding off the big chill. Better yet, the pouch can be unzipped and the fleecy liner can be used all year around. Priced $59.95, the Fleecy Winter Pouch is available in Silver Dusk or Royal Navy and Liquorice. Perhaps you need a bit of middle ground in the area of pram pouches if you live in an area that’s a little milder in temperature. When it’s still cold, but not too cold, I suggest the Cosy Toes Foot Muff for protecting against cool breezes and keeping the littlest of toes toasty warm. Made from lightweight fabric and looking super smart, the Cosy Toes Foot Muff has two new colours – Silver Dusk and Royal Navy joining the existing Liquorice option and is priced $34.95. There’s no denying that the Redsbaby Bounce pram has a very roomy storage basket, but let’s face it – often we want things at our fingertips so we can find them without having to rummage under the seat. The Get Organised! 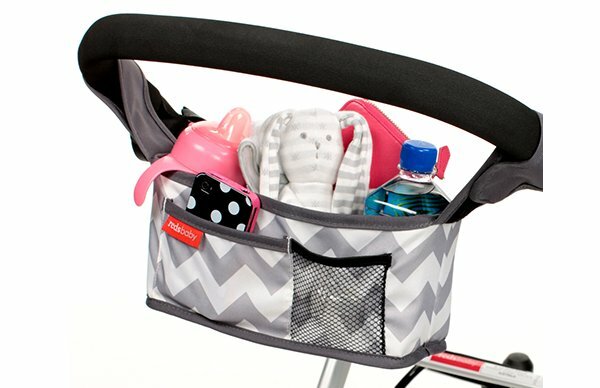 Pram Organiser is a dream for anyone who likes to get out and about with all their essentials up front. Keep your phone, purse and keys secure within a zip compartment and baby’s dummy, snacks and all essentials handy and easily accessible. Priced $24.95, you can choose to be organised in Silver Dusk or Royal Navy. 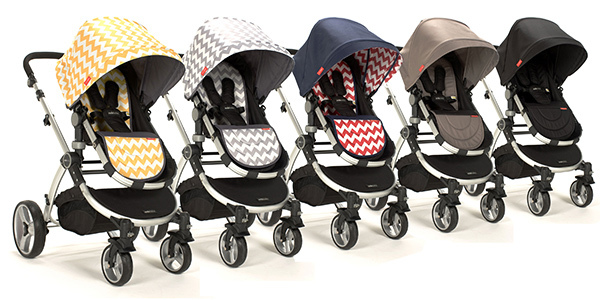 Redsbaby have also launched awesome mix and match colour separates – you can now personalise your Bounce pram by choosing which colour best suits your style. Choose from Silver Dusk, Royal Navy, Lemon Zest and Liquorice when kitting out your ride with either the Switch It! 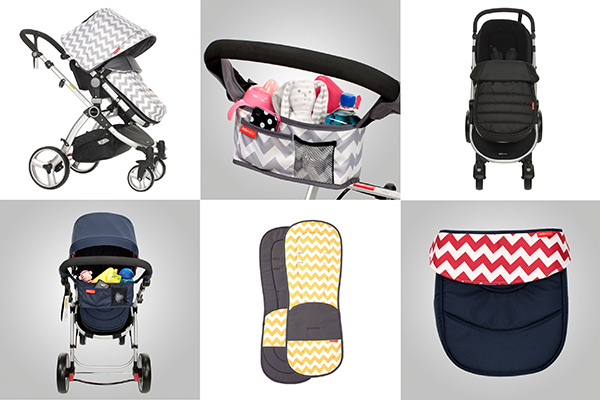 Reversible Seat Liner ($29.95) or the Peek-a-Boo! Bounce Canopy ($34.95). Alternatively, if you want to give your Bounce pram the big makeover you can save buy purchasing both the seat liner and canopy in the Colour Duo Set, priced $59.95. Don’t forget when the weather finally does become warmer, you want to be prepared with a insect net for your pram to prevent insect bites – the Shoofly! Bounce Insect Net fits over the bassinet and pram seat completely and is priced only $6.95! 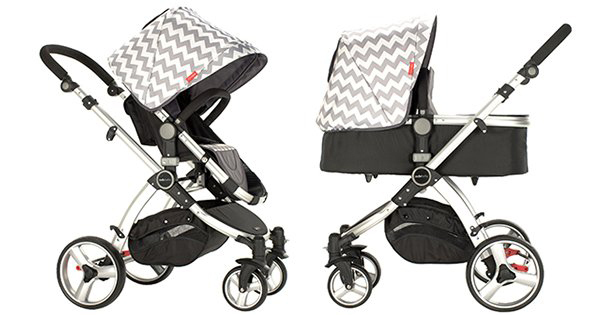 The Redsbaby Bounce pram is a stunning, lightweight pram. It may weigh in at only 8.5 kilograms, but it doesn’t skimp on comfort or style. 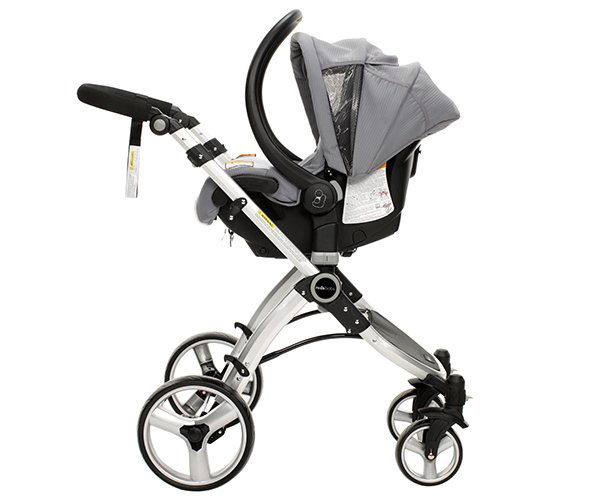 The four wheel design makes it a joy to push and it has all the bells and whistles of any designer pram, only without the high end price tag. 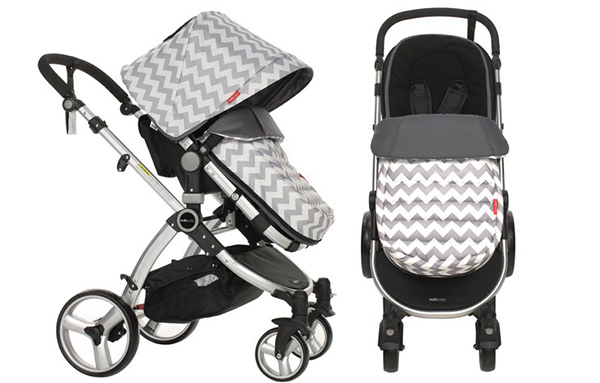 Choose from modern prints and contemporary solid colours, the Bounce pram is priced $499 or you can purchase both the Bounce pram and bassinet attachment as a set for $549 direct from Redsbaby, with Australia wide delivery available.